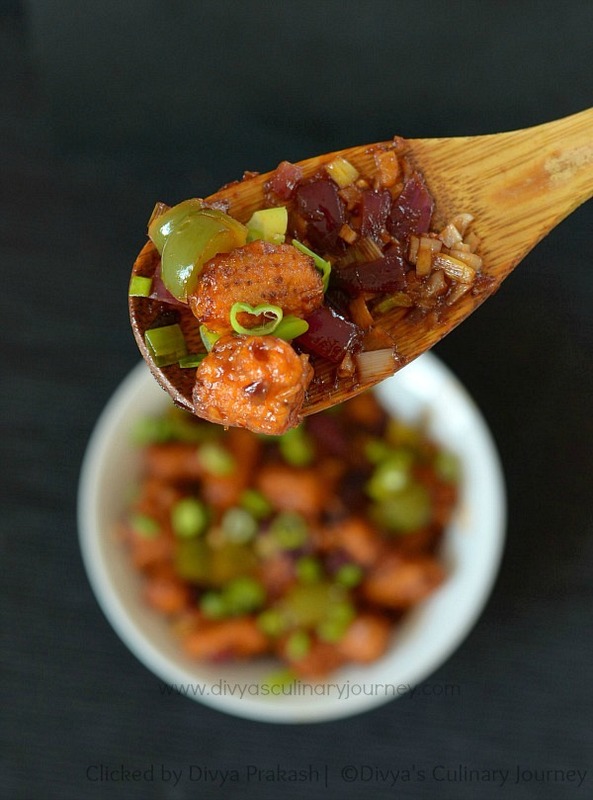 I am going to share Baby corn Manchurian recipe today. I prepared the semi dry version and it can be served as an appetizer. This is a Indo Chinese recipe where baby corn fritters are tossed in a sweet,spicy,tangy sauce. 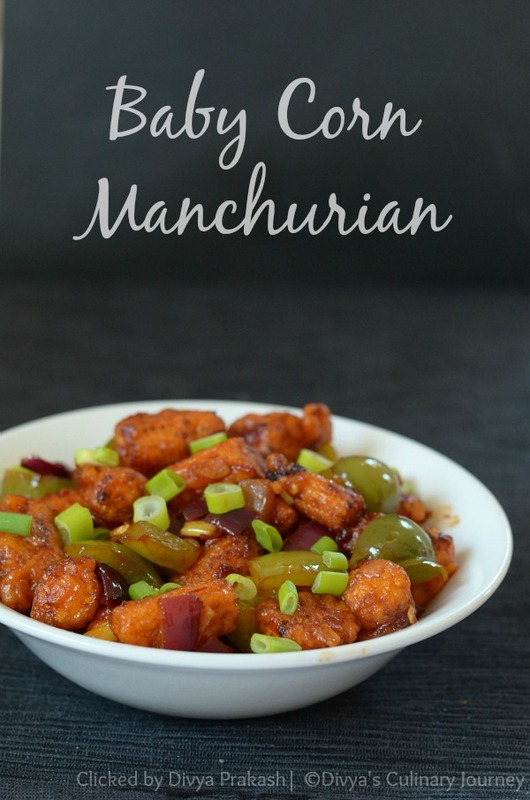 I have already posted Gobi Manchurian and Mushroom Manchurian recipe before. I felt this is very easy to make and just that it is a little time consuming but it is totally worth it. 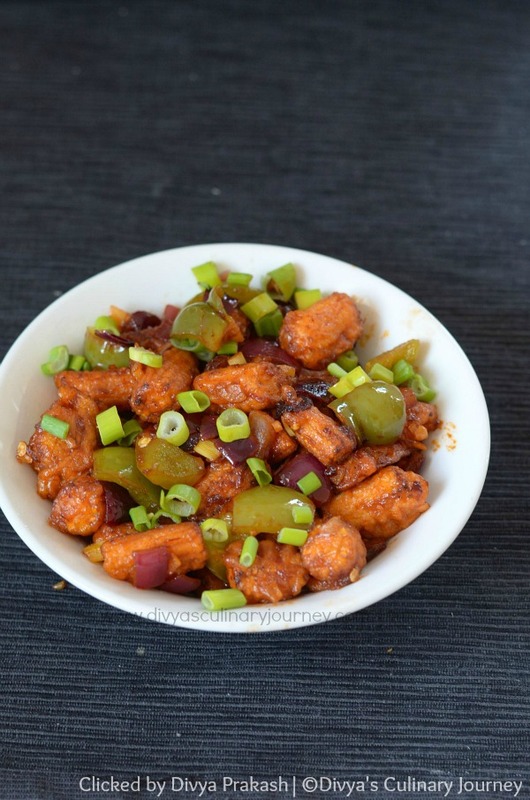 My kids totally loved this baby corn manchurian. Even before the manchurian was ready, my kids kept gobbling the baby corn fritters as I was preparing them. I had to shoo them away to save them from finishing it before I could toss them in the sauce. Then they couldn't wait till I finished clicking the pictures. They loved the end product too. Some how this baby corn manchurian is a great hit at home. It can be served with Vegetable fried Rice or noodles or can be had just as an appetizer. Chop the spring onions. The bottom white part will be used for sauteing while the top green part will be used for garnishing. 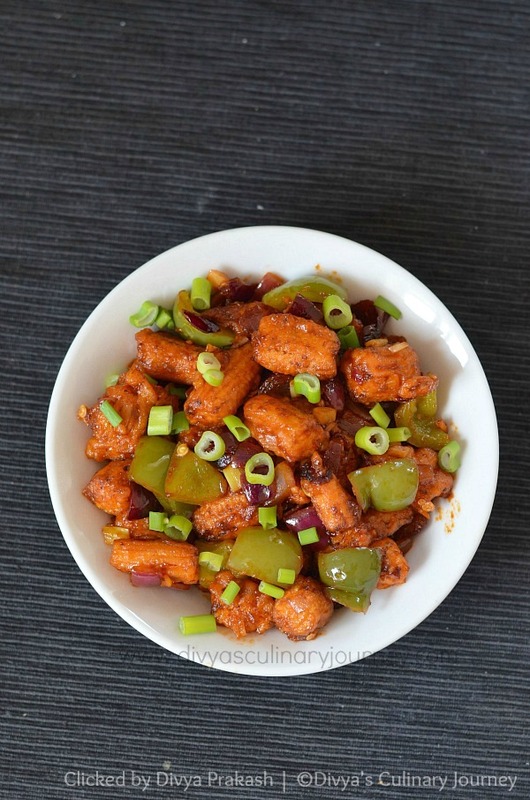 How to prepare Baby Corn Manchurian? Prepare the batter for the fritters using the ingredients listed above. The batter should not be too thick or too thin. Put the baby corn in the batter such that it is fully coated with it. Heat oil and deep fry baby corn in small batches till they are slightly golden. Take them out of the oil and drain excess oil in paper towel. Once the baby corn fritters are ready, lets get ready to prepare the sauce. Heat oil in a wok, add the diced onions, slit green chillies and bell pepper and saute till the onions turn translucent. Then to this add the bottom white part of spring onions, minced ginger and garlic and fry for a minute. To this add tomato ketchup, soya sauce, chilli sauce and vinegar and sprinkle some water and cook for couple of minutes. Then add the baby corn fritters to the sauce. Toss well such that all the fritters are coated well. Turn off the heat. Garnish with spring onions and serve it warm. Add salt in moderation, as soya sauce has salt too. If salt is less, it can be adjusted later. Prepare the fritters in advance and the rest can be cooked just before serving. Because I feel it is the best when served warm. 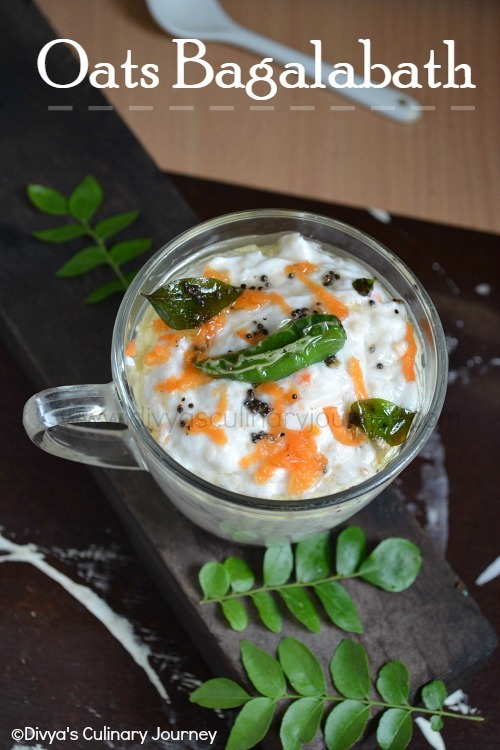 So tempting and delicious, loving it..
Super clicks and mouth watering recipe dear !! !